Santa Maria Novella launched Angels of Florence last year to honor the 40th anniversary of the 1966 flood that destroyed numerous cultural works in Florence, including close to a million books in the Biblioteca Nazionale. 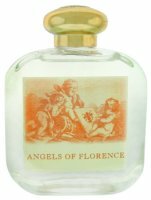 The fragrance benefits the Angels of Florence, a non-profit organization working to restore those items. You can read more about their "Adopt-A-Book" program here. The 100 ml bottle of Eau de Cologne is $84 at aedes, and I will update later with the fragrance notes if I can find them. The head note starts with the flower and fresh note of jasmine, lillac, rose, gardenia, ylang-ylang, geranium, cyclamen, bergamot, orange blossom and Antille lime. The fruity strong notes of peach, prune and melon introduce a green-spicy complex body where we can smell inklings of violet leaves, black ribes buds and cinnamon rind but which receives flower nuances of ireos. Ireos is another word for orris (iris); black ribes buds are black currant buds. By the way, I have also updated the notes for Ellie D.
I remember the 1966 flood: my parents and I had visited Venice (which was, of course, terribly affected) only about a week before. The trip was a reward for me for passing my baccalauréat. The weather had been absolutely fine. I've never been back to Venice nor have I ever been to Florence. Still hoping I might have the chance (and the energy) to do so one day. J, that is amazing that you were there just the week before! My Florence story is that I was there, I was in the SMN store, and I bought: nothing. I was not yet interested in fragrance, and went in more to see the building than anything else. Can you imagine what I'd spend there today? OMG. we were in the country at the same time! You were in Florence at the time of the flood?! It must have been quite horrendous. I've always wanted to go there (it was so easy when I lived in Nice, but I never found the right time somehow). I don't even want to think how much you'd spend in the SMN store these days. LOL! I'm not surprised they're still trying to repair the damage after all this time: Italy is 'eternal' and time doesn't matter there. They care deeply about their past and spare no effort to keep it alive. I find that heartwarming. I've been replaying your comment in my head: I misunderstood it, didn't I? You didn't mean you were in Florence 40 years ago. 'course not! Silly me. LOL! *taps fingers, waits for notes* Don't know why I am so interested, I could probably use fingers of one hand to count the SMN scents I liked (not loved, just liked), but interested I am. If the notes are not even online at Aedes, they are perhaps not to be had at all, so to speak — so pray do not start tapping your fingers, LOL! SMN, honestly, appears to do just about nothing at all to publicize their own fragrances. I have sent an email to Lafco, but they don't even have it on their website yet so not hopeful. I gathered that…. too late. LOL! You know, I was in Florence about nine years ago, and I didn't make it to SMN or iPdF or anything! I didn't even know they existed then. I love that bottle label, and the name, and will be devastated if it turns out to be a fruity floral. I've never smelled a single SMN fragrance, but I love the “style” of the brand (vintage feel). They've just opened a store in São Paulo, but it's still too far to make a visit. Hope they will open one nearer to you then! They have some lovely scents — and Eva would be perfect for your weather. I'm very curious about Eva and also about Melograno. My only conclusion after reading all those notes is that I'm going to have to order a sample. It could easily go in the right direction, magnifying the notes I'm most interested in, or it could go to the dark side and amplify the notes I'm phobic about (geranium, melon, etc.). But it does sound wonderfully complex and that predisposes me to be appreciative of it. Oh, and thanks for the Ellie notes update! I'm feeling better about having resisted placing an unsniffed order (came frighteningly close to doing so). I asked the SA at Bendel's about the notes and he commented that the vanilla wasn't too foody, which made me nervous (and prevented the immediate order) since I'd rather not have it be evident at *all*. Add coconut, lotv and cyclamen to that and I'm definitely feeling the need to test it first. Robin, *thank you* for locating and posting these notes! It sounds lovely. Now I need to make a trip down to Aedes. Also love their very old fashioned & simple “Queen's Cologne/Acqua di Colonia”. Oh dear, somehow I managed when formatting the above to entirely miss the melon. I am fairly phobic about melon too. Coconut can go either way. Well, we shall see! Let us know how it is!! I'm actually surprised they're not charging more–although, the current price is probably more attractive to larger groups of people, upping the liklihood of a strong response.